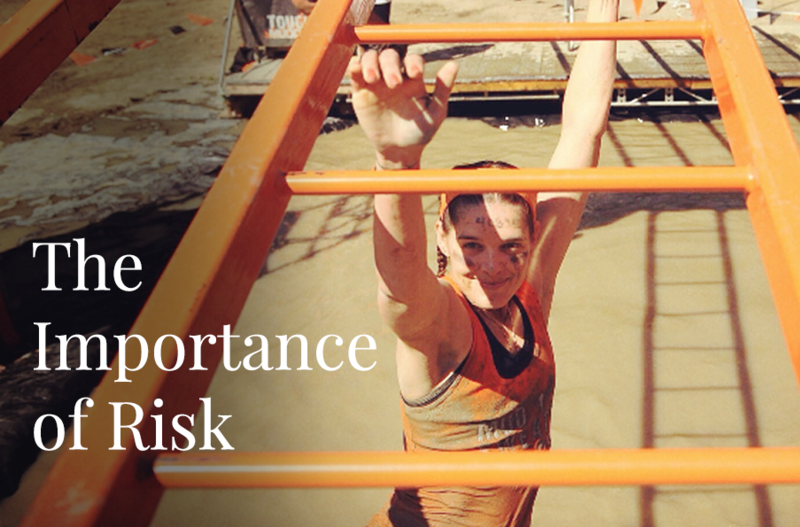 Make no bones about it: risk is terrifying, and failure can be devastating. But they are both also critical to strength. When I decided to leave my old career – my old life – and start a completely new one, more than a few people who cared about me wondered if I was a little crazy. I wondered if I was crazy. Who would give up the kind of certainty and success that I had worked so hard to achieve just to gamble it all on a book and a new business? Plus, I was moving 3,000 miles away, giving up a strong support network…who would do such a thing? Well, I would, and I did. And honestly, I have never looked back. Easy to say on this side of things, right, after I got a book deal, after I didn’t fail? Well, yes and no. Hindsight is 20/20, after all, so yes, it is nice to breathe a little sigh of relief at the fact that I didn’t immediately fall on my face. But the truth is, I could still fail (what if my book sells poorly? What if I don’t gain an audience? What if I run out of things to say?). And what’s most important to remember, is that it doesn’t matter. Outright failure and success are not the only ways to determine whether a risk was worth taking. What? Crazy talk, you say! Ok, hear me out. I want you to try an experiment: try not to define failure and success so narrowly. Is it only “success” if you achieve every aspect of your stated goal? Is it always “failure” if anything fails to go according to plan? “It’s the journey, not the destination” is a cliché for a reason: because it’s true! Even “failure” leads to growth, to new beginnings, new opportunities, unexpected side effects, and all sorts of wonderful silver linings that we may never have stumbled upon by playing it safe. And success can take many forms, including growth and serendipitous outcomes. That’s not to say that it isn’t important to calculate the risk – no need to be reckless, after all. But I will tell you that in my experience, most people are much more prone to be overly cautious than needlessly reckless, so for most of you reading this, I would encourage you to take more risks, not fewer. Ironically enough, just last week, I found myself face-to-face once again with fear and risk. While attending Keri Murphy’s Brilliant Event in L.A. which brought together some of today’s most brilliant and innovative women in business, I was presented with an opportunity that I was confident would help me stand out in the ever-changing landscape of entrepreneurs. I had been researching this particular training program for weeks, and now that I saw it in action and working for other entrepreneurs, I felt more confident that this was in fact the right investment for me and my business. So, what’s the big deal, right? “Just do it” you might say. Well, my fear stemmed from the fact that for me, at this early stage in my business, I didn’t feel that I deserved to take on this additional financial risk, even though I felt in my gut that it was right for me and would in fact help grow my business. I belabored over the questions I continued to ask myself, “how will you pay for it?”, and “what guarantee do you have that this will work for you”? The only answer I had for myself, was that with hard work, and the skills of this additional training and coaching, I would make the money back somehow. I thought long and hard about it. I put it out into the universe, and I even asked God for guidance. I also remembered something that speaker, Ali Brown had said in her speech the day prior, “don’t let fear make decisions for you and your business. The money will come, but you have to walk through the door in order to see what’s on the other side”. I woke up that morning with better clarity, and knew what I had to do. I chose to move ahead, and made the commitment to myself and my business that I would find a way to make it work. I laid down the old credit card and signed on the dotted line. Shortly after doing so, I no longer felt a knot in my stomach even though I knew I had a lot of hard work ahead of me. The following day, I flew back home to Northern California. Per usual, upon heading up my driveway, I stopped at the mailbox. I emptied its contents which had grown into a pretty large pile after being away for almost a week. I began to sift through the mail and came across a large white envelope from my accountant. Yikes! “This could be really bad news”, I thought. I tore open the envelope, and to my surprise instead of a note saying I owed the IRS money for last year, the letter stated that I was due to get a refund from both the federal government, and the District of Columbia. The total amount of the refund… the same exact cost of the investment I had just made the day prior. Wow! Right?! I couldn’t believe it! I had to look twice through the tears falling down my face. The only thing I could think to say out loud was “message received, thank you”. I will never make a decision based on fear ever again. I often find that the most important question you can ask yourself is, “What’s the worst that could (likely) happen?” I don’t mean saying that rhetorically; I mean really asking yourself that question and genuinely answering it. Like so many exercises, this one requires radical honesty. Could you lose your job? Lose your friends? Get in legal trouble? Or is the worst that you might face rejection, might lose some money, might look foolish? I’m not trying to minimize this last list; these things matter! But they don’t necessarily have to be deal breakers and you can move forward from them. It’s important to be very clear with yourself on what the real stakes are. If you find that the downsides are tied more to your own fears or insecurities than they are to actual likelihoods of serious damage, then you will have answered your own question of whether it’s a risk worth taking. Sometimes the difference between “good” and “great” is the ability to act on instinct and to face risk. Do you want to be safe and good, or do you want to take a chance and be great? Share your comments with us.